I teamed up with the California Walnuts to bring you these Halloween Walnuts! I’ve been compensated for my time. All opinions are mine alone. 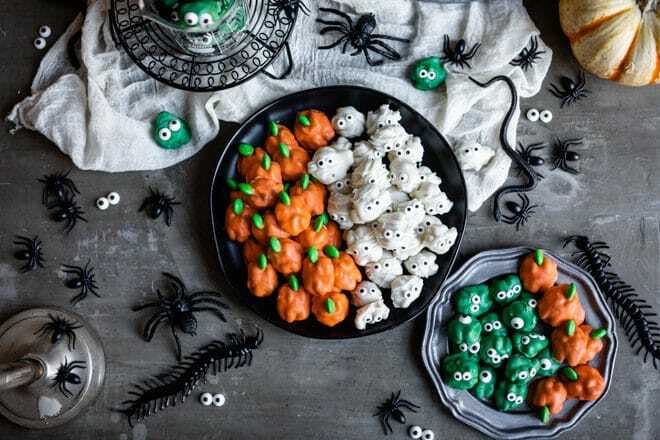 These easy, adorable Halloween walnuts are coated in colorful candy melts and make a wholesome sweet treat. 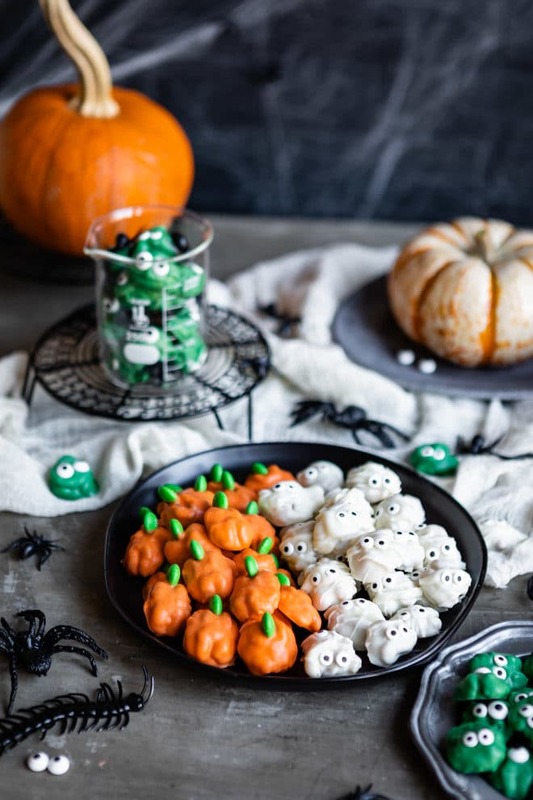 Add candy eyes for scary monsters or candy-coated chocolates for pumpkin stems. Your kids will definitely want to get in on the decorating fun, too! Halloween is just around the corner, and that means one thing in my house: CANDY. 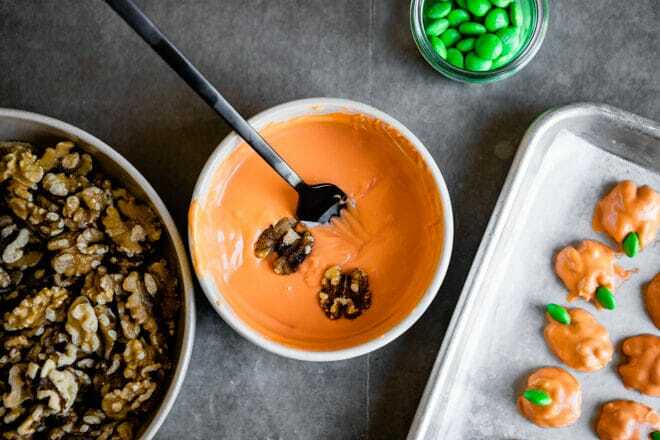 This year we’re going to be making some of our own (call it practice for Christmas) and these Halloween Walnuts feel like the perfect balance of nutrition and fun. We could coat anything in candy melts, right? I picked walnuts because one ounce has 4 grams of protein, 2 grams of fiber, and good fats instead of just empty calories. I’d rather serve my kids walnuts than pretzels, and I don’t have to worry about peanut allergies either. More than 99% of all walnuts grown in the United States come from California’s Central Valley, and I’m so happy to support my state. California also supplies 75% of internationally-traded walnuts. Candy melts are made from sugar, vegetable oil, whey powder, milk solids, salt, colorings, and flavorings. They look and taste like white chocolate but don’t need to be tempered the way chocolate does. In fact, you can just melt them in the microwave until smooth (or see my method for using a double-boiler below). Where can you buy Candy Melts? You can buy candy melts on Amazon (links in recipe card) or locally at Walmart, Michaels, or other crafty stores. Look in the specialty baking section (which is often near the wedding section). If you don’t see the exact color you are looking for, use your imagination and substitute something else! Scary monsters come in all sorts of colors. How do you melt Candy Melts in the microwave? In a microwave-safe bowl, microwave candy melts at 40% power or defrost setting for 1 minute. Continue to microwave and stir at 30-second intervals until smooth and completely melted. If your candy melts feel too thick and clumpy no matter how long you heat them, stir in 1 teaspoon of vegetable oil at a time until desired consistency is reached. How do you melt Candy Melts in a double-boiler? Set a heat-safe bowl over a pot of simmering water (the water should not be touching the bottom of the bowl). Add candy melts and stir until smooth (about 3 minutes). How else can I decorate Halloween Walnuts? Use black candy melts and candy eyes to make spiders. 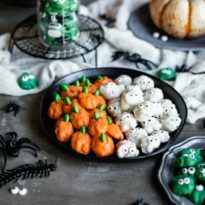 Use light green candy melts and candy eyes to make Frankenstein monsters. 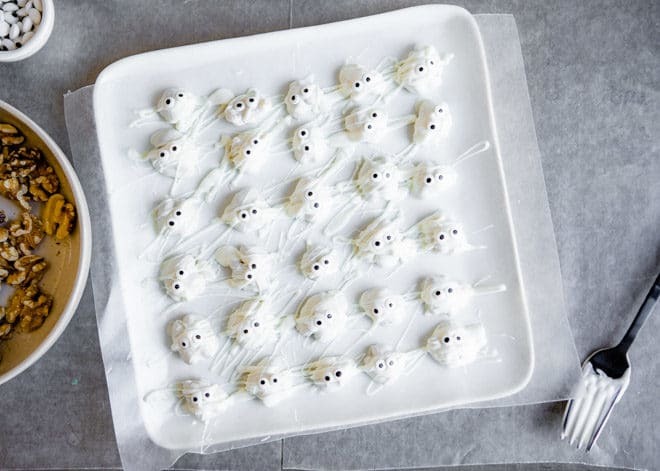 Use white candy melts (without the drizzle) and candy eyes to make ghosts. Use brown candy melts with candy eyes and yellow candies to make owls. Use white, yellow, and orange candy melts in layers to make a candy corn design. 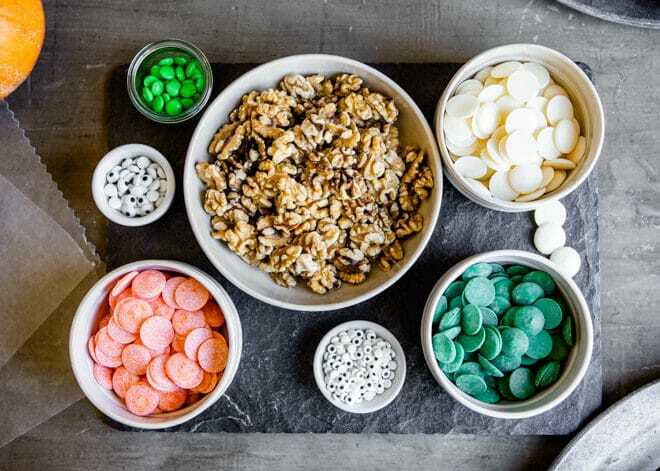 Use a mixture of Halloween-themed sprinkles. Line a plate or baking sheet with parchment paper or wax paper (something that will fit in your refrigerator). In a microwave-safe bowl, microwave candy melts at 40% power or defrost setting for 1 minute. Stir thoroughly. Continue to microwave and stir at 30-second intervals until smooth and completely melted. Dip California Walnut halves into melted orange candy melts and transfer to parchment paper. While the chocolate is still melted, add a green chocolate candy to one end for the "stem." Refrigerate until the candy is set, about 30 minutes. Dip California Walnut halves into melted white candy melts and transfer to parchment paper. Using a spoon, drizzle more white chocolate over the walnuts to create the look of "bandages." While the chocolate is still melted, add googly eye candies. Refrigerate until the candy is set, about 30 minutes. Dip California Walnut halves into melted green candy melts and transfer to parchment paper. 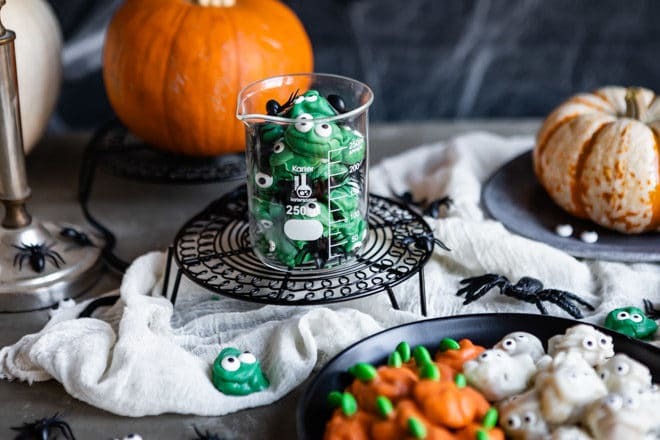 While the chocolate is still melted, add googly eye candies. Refrigerate until the candy is set, about 30 minutes.